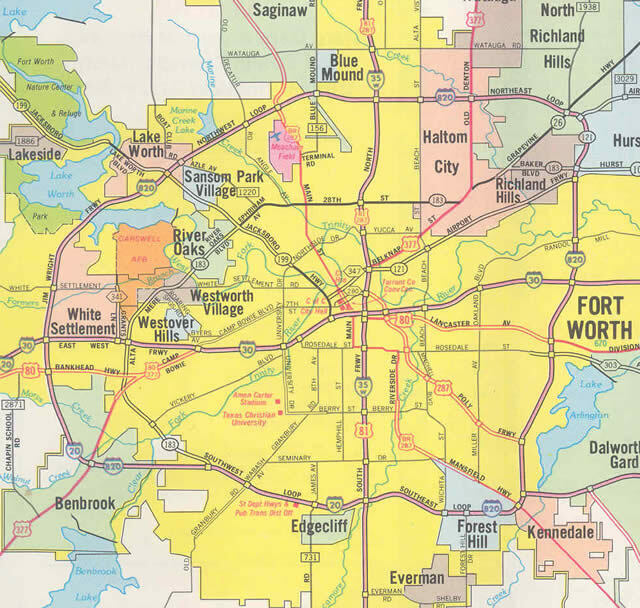 Part of the Fort Worth beltway, Interstate 820 (Jim Wright Freeway) wraps around the west, north, and east sides of the city. The southern portion of the beltway consists of Interstate 20. Also, U.S. 287 ties into the Interstate briefly along the southeast quadrant of the beltway. 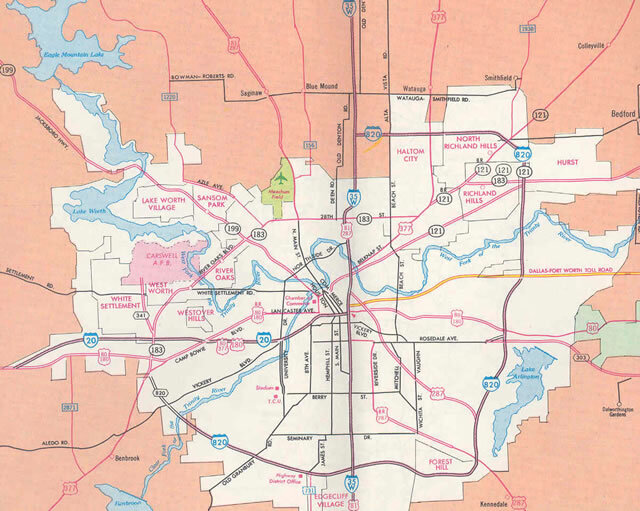 When originally conceived, Interstate 820 was planned to be routed over the entire beltway. 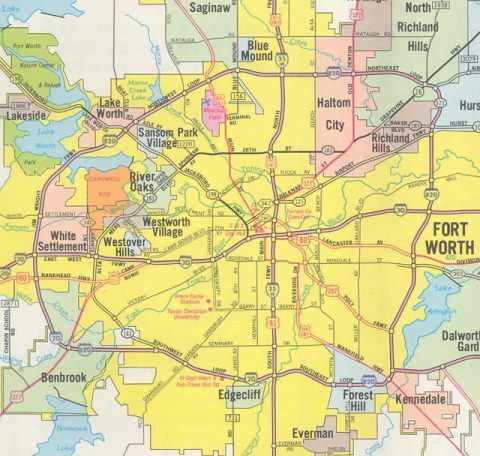 However, this plan was based on the idea that Interstate 20 would run along the path currently occupied by Interstate 30 via the now-defunct Dallas-Fort Worth Turnpike. 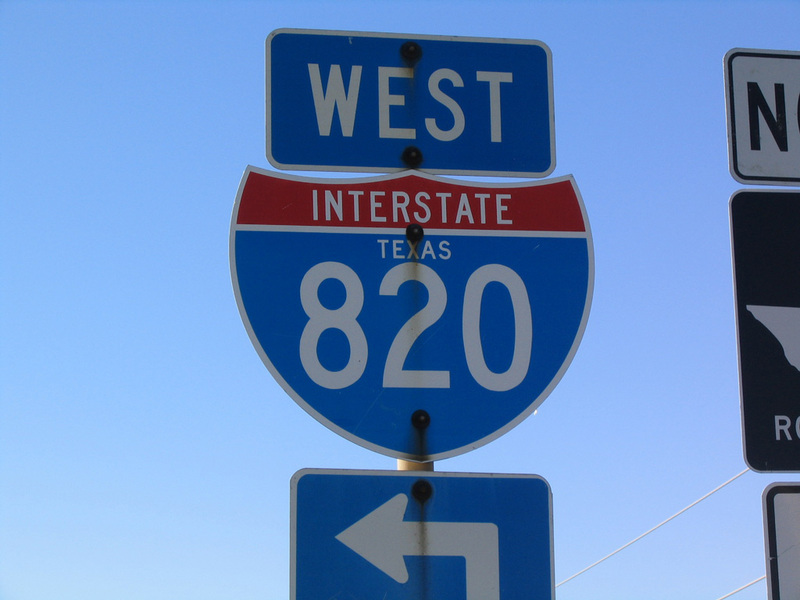 Once Interstate 20 was rerouted to a new alignment south of the city centers of Dallas and Fort Worth, Interstate 820 was truncated to include only 270 degrees of the beltway. 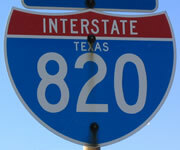 Interstate 820 incorporated a section of State Loop 820, which is today part of SH 183. The freeway loop was eventually extended further west. Interstate 820 at FM 1220 (Azle Avenue) in the city of Lake Worth, Texas. Photo taken 10/19/03. Heading west from Arlington, U.S. 287 north briefly combines with IH 20 west to IH 820 north. 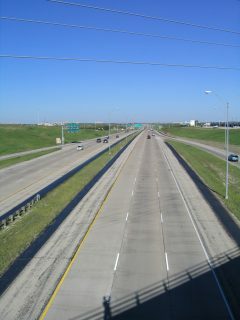 The freeway passes just south of Lake Arlington and north of Kennedale on this stretch. Photo taken by Justin Cozart (08/17/03). Exit 442B departs IH 20 west for IH 820 & U.S. 287 north. IH 820 travels west of Lake Arlington through east Fort Worth to Richland Hills. U.S. 287 branches northwest form nearby along the Martin Luther King, Jr. Freeway en route to Downtown Fort Worth. Photo taken by Justin Cozart (08/17/03). One half mile ahead of the IH 20 westbound partition with IH 820 north. Three lanes join the beltway north toward White Settlement while IH 20 reduces to two for rural departure from the Fort Worth metropolitan area. Photo taken by Justin Cozart (08/02). U.S. 377 crosses paths with IH 20 just south of the IH 820 western terminus. A c/d roadway runs along the westbound lanes of IH 20, providing access to both freeways from U.S. 377. Abilene lies 138 miles from this point. Photo taken by Justin Cozart (08/02). Interstate 20 east enters the semi directional T interchange with IH 820 north at Exit 428. IH 20 overtakes the beltway east through Benbrook. Photo taken by Robert Lee (06/02/06). Approaching the split with SH 183 (Southwest Boulevard) on Interstate 20 westbound. Both of these routes were originally Interstate 820, with SH 183 representing the original alignment for the Fort Worth loop. Photo taken by Justin Cozart (08/17/03). SH 183 (Southwest Boulevard) north at Vickery Boulevard. The freeway transitions into an at-grade arterial just ahead. Photo taken by Justin Cozart (08/17/03). An on-ramp from Vickery Boulevard merges onto SH 183 north at the freeway end. The signalized intersection with Overhill Road is next. Photo taken by Justin Cozart (08/17/03). Justin Cozart, email: “I-820 pre-1962 western end.” August 17, 2003.